Hello friends, how you all doing. Today I am really excited to share one of amazing products which I got recently for PR and I just cant stop loving it since the time I have received it, since its so good and so useful. It will refresh you, relax you and all together rejuvenate you after your long tiring day. I know you are already excited to know more about such a wonder product – Its 2 in 1 Humidifier & Air diffuser from Allin Exporters. I know these aroma diffusers are quite common these days due to its aromatic and refreshing properties. I was considering to buy one since long and was fortunate enough to receive it from one of the best brands – Allin Exporters. An ultrasonic humidifier is a device designed to use ultrasonic waves for the creation of a fine mist of the water in the presence of electric current at the ultrasonic frequency. Use of ultrasonic humidifier or aroma diffuser brings soothing moisture into the atmosphere of the interiors. When diffused within the interiors of home and office, an ultrasonic humidifier helps to assist in relieving dry throat, coughs, itchy or dry skin, colds, and congestion by significantly increasing the moisture level of interiors. The fine aerosol mist originated from Ultrasonic Humidifier disseminates quickly into the air flow leaving the coolness and selected aroma. • Minimizes Risk of Infections : Undoubtedly, most of the bacteria and virus, responsible for cough, cold, flu and other infectious conditions, thrive in the dry air. Ultrasonic Aroma Diffuser + Humidifier helps to combat these conditions by maintaining the humidity level in the air. The ultra-fine mist of water and natural fragrance helps to keep the virus and bacteria away from the interiors whilst spreading a calming aroma. • Maintain Humidity in the Air : Helps to preserve the moisture level in the air to ensure a healthy interior irrespective of the outside weather. Regular use of ultrasonic humidifier during the resting sessions helps to promote a good night's sleep. • Clears Congestion : Most of the persons are susceptible towards congestion that is caused due to insufficient moisture level in the air near around. Ultrasonic Aroma Diffuser + Humidifier adds up the moisture in the air to increase the humidity level that in turns ensure optimal breathing conditions for yourself and your loved ones. • Firm and Moisturized Skin : The skin is one of the most sensitive part of the human body that get affected by the lower humidity level in the atmosphere near around. Using Ultrasonic Aroma Diffuser and Humidifier helps to moisturized the skin to prevent the condition of dry and flaky skin whilst lending a soft and supple feel. • Helping Hand for Croup : Using an ultrasonic humidifier within the home helps to prevent the condition of Croup in the children that is mainly caused by a virus. Just choose the desired water-soluble essential oil and water to fill in the aroma diffuser for spreading comfort and relaxed feel within the interiors. • Sinus and Throat Comfort : Everyone knows what dry atmosphere can do to the throat, sinus and respiratory tract. The dry air around the surroundings gives rise various breathing problems and throat infections. Ultrasonic Aroma Diffuser and Humidifier help to reduce the possibility of throat and sinus discomfort by increasing the humidity level in the dry air. • Snore Relief : Snoring is often associated with the problem of dry sinus and throat. So what could be the better option than increasing the moisture level within your interiors with Ultrasonic Aroma Diffuser and Humidifier? It helps to create a comfortable environment within the interiors by diffusing fine mist of vapor that promotes a deep and better sleep free from snores. • Dry Air from AC : No one can deny the fact that a room with an air conditioner is almost as dry as a desert. It is almost considered a must to use an ultrasonic humidifier within the interiors to keep the perfect moisture level within the interiors. Ensure to remain in a comfortable and healthy interior with Ultrasonic Aroma Diffuser and Humidifier. • Protect Furnishings and Indoor Plants : Optimal moisture is not only considered ideal for humans but it is also a necessity for the indoor plants and interior furnishings. Without the proper level of humidity within the interiors, indoor plants begin to die whereas the furniture starts developing cracks. 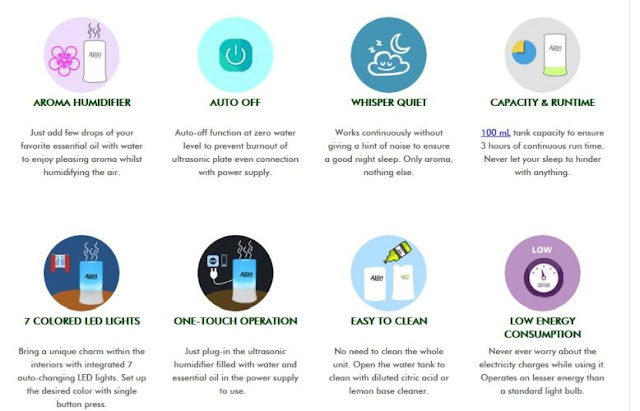 It is a hidden benefit of the ultrasonic humidifier that most of the persons are unaware of. Before proceeding let me start with few details of this Allin Exporter Humidifier and Diffuser. • Latest ultrasonic technology to transform the water molecules into fine micro-particles without the use of heat. • Perfect choice to opt for interiors such as bedroom, bathroom, office, and cubicles. • Equipped with a 100 ml water tank to continuously operate for 3-4 hours. • Ideal for using as an aroma diffuser and/or ultrasonic humidifier. Auto shut-off feature. • Single-button start feature to set the device ON to enjoy moisturized and healthy skin. • Auto power off when water runs out. • Shop with Confidence with our 45-days replacement warranty against any kind of manufacturing defect. • Delivered to your doorstep within 3-5 business days. Price – Rs 3050/- for 100 ml diffuser. (Available at discount for Rs 1830/- at Allin Exporters Site). 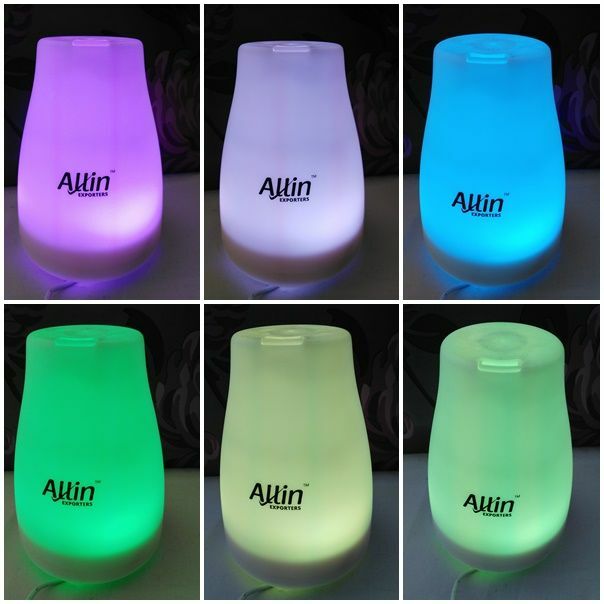 Why Choosing Allin Exporters Diffuser Humidifier Among Rest? At Allin Exporters, we constantly thrive to offer an extensive range of solutions for attaining an overall state of mental, physical and emotional well-being. Our technologically-advanced Allin Exporters LED Ultrasonic Aroma Diffuser + Humidifier is made under the stern guidance of professionals using only quality-tested components in adherence with the international standards. The offered Ultrasonic Humidifier ensures to maintain the moisture level in your interiors so that you and your loved ones can enjoy a peaceful stay. Just add water & your desired fragrance and set the timer as per your need to spread the aroma. 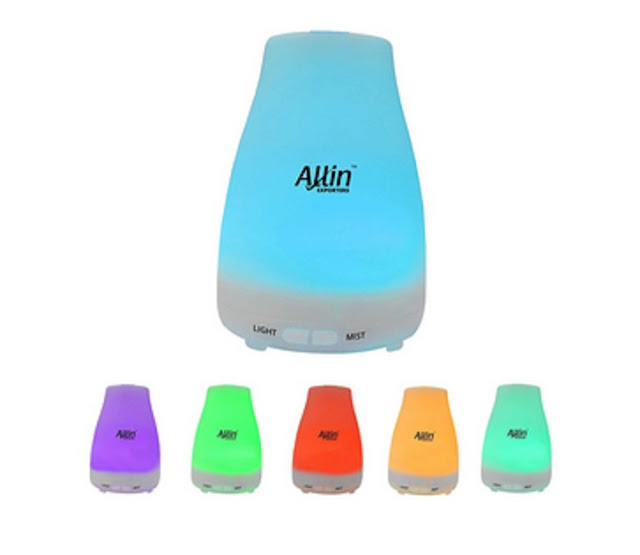 The offered Ultrasonic Humidifier + Aroma Diffuser by Allin Exporters is a revolutionary device for home, offices, aromatherapy centers and other recreational places. Featured with ultrasonic technology, it is made using the premium quality ABS (Acrylonitrile Butadiene Styrene) plastic and quality-tested components to ensure its dual usability. It uses ultrasonic frequencies to create vibrations in the liquid that are carried to the upper surface of the water to slowly vaporize the oil and water in the form of ultra-fine mist into the air without using any kind of heat. • As A Standalone ULTRASONIC HUMIDIFIER: When it is used with water only, it acts as an indoor humidifier. Dryness is something that no one likes irrespective of the climate. It is the sole reason for various allergies related to skin and respiratory tracts. The extensive demand of this humidifier in the home and offices is only due to the fact that it can help to maintain the optimal moisture level in the interiors for a comfortable feel. 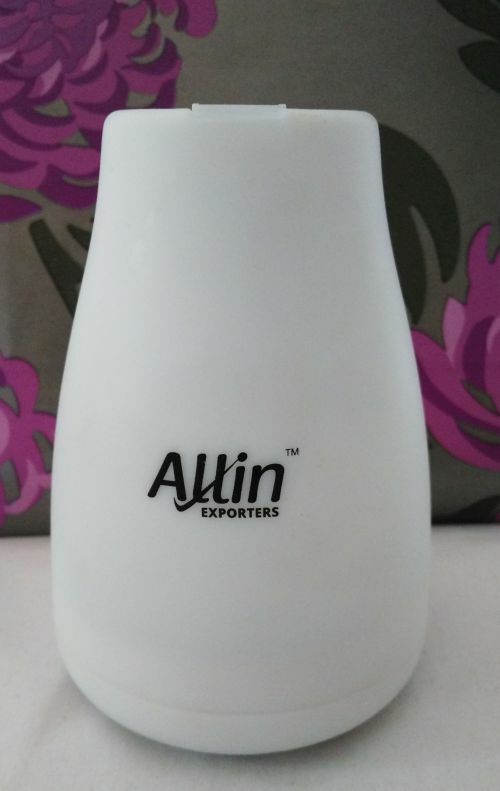 • Allin Exporters LED Ultrasonic Humidifier + Aroma Diffuser is the popular device that uses high-frequency vibrations (Ultrasonic technology) to convert the water into the micro-fine mist to bring a comfortable environment in any interior. It immediately ionizes the water drops to create the fine mist at the room temperature so that the mist can quickly dissipate in the atmosphere of interiors. • As An Indoor AROMA DIFFUSER: This easy to fill and innovative Aroma Diffuser + Ultrasonic Humidifier is the perfect choice to spread the calming and therapeutic aroma of the essential oils and other fragrances within the interiors. Its auto-mist technology ensures to provide constant freshness in your interiors for enhanced comfort and relaxation. • The offered Aroma Diffuser relies on the ultrasonic technology to create visible and micro-fine mist using the combination of stored essential oil and water. It is not like those electronic diffuser and aroma burners that use heat to create mist containing humidity that results in loss of aroma and therapeutic properties of essential oils. The offered Aroma Diffuser + Ultrasonic Humidifier ensure to preserve the natural fragrance and therapeutic properties of the essential oils used in it to promote a healthy living. I hope you enjoyed reading my review and experience with this Allin Exporters 2 in ! Aroma Diffuser & Humidifier. If you are suffering from any of the above listed ailments or just want a fresh pure aromatic air in your surroundings, just add this amazing product to your place since its all natural, safe, effective and affordable. Labels: Air Cleanser, Allin Exporters, Beautiful Skin, Beauty, Beauty Naturally, Foods For Healthy Hair and Skin, HEALTHY LIVING, Natural Blood Cleanser & Purifier, Organic Health Supplements.